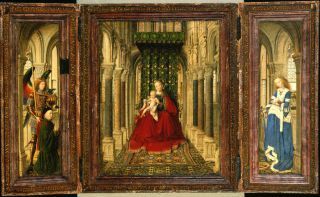 The creator of this triptych, which was intended as a small travel altar for private prayer, was Jan van Eyck, the most important representative of Old Netherlandish painting. Characteristic features of his new artistic style are the miniature-like, extremely realistic rendering of details and the use of brilliant colours. Enthroned in the centre of the Basilica is the Madonna with her son, the infant Christ. Stretched out at her feet is a precious woven carpet. It has a rhombic pattern featuring eight-pointed stars set in circles. Its intense colours contrast with the muted hues of the ingeniously patterned floor tiles. Artist signature: "Johannes de eyck me fecit et c(o)mplevit Anno Dm M• CCCC• XXXVII• ALC• IXH• XAN"
This travel altar is known to have been in Dresden since it was first mentioned in the 1754 inventory-where it was still recorded as a work of Dürer. Campbell, Lorne, "Jan Van Eyck. Dresden and Bruges", The Burlington Magazine, 148. 1235 (February 2006): 138–140. Ketelsen, Th., and Neidhardt, U. et al. (eds), Das Geheimnis des Jan van Eyck: Die frühen niederländischen Zeichnungen und Gemälde in Dresden exhibition catalogue, München et al. : Deutscher Kunstverlag, 2005: 177ff. Marx, Harald (ed), Gemäldegalerie Alte Meister, 2 vols, Köln: Buchhandlung Walther König, 2005/07: vol. 1 386f., vol. 2 244, gallery n. 799. Neidhardt, U., and C. Schölzel, "Jan van Eyck’s Dresden Triptych. ", in S. Foister et al. (eds), Investigating Jan van Eyck, Turnhout: Brepols, 2000: 25–39. Neidhardt, U.,"The Development Process of the Dresden Triptych. News and Questions", in Ch. Currie (ed), Van Eyck Studies: Papers presented at the eighteenth symposium for the study of underdrawing and technology in panting, Paris et al. : Peeters Publishers, 2017: 351–366.